Mobile gaming is more popular than ever. 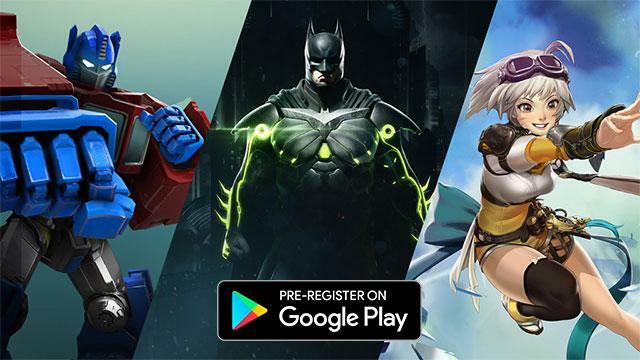 Over the past year, we saw breakout hits, including Pokemon GO, Star Wars: Galaxy of Heroes, Clash Royale and Reigns introduce new, high quality gaming experiences on Google Play. Gamers around the world were also able to access Google Play more easily than ever before, helping developers reach a larger audience and grow their businesses. In 2016, nearly 300 million new (30 day active) users adopted Android devices from emerging markets such as India, Brazil, and Indonesia. And last year, more than 100 million new users were able to access locally relevant forms of payments (such as direct carrier billing or gift cards) helping more people globally access and buy their favorite apps and games on Google Play. We've also focused heavily on polishing our software and hardware offerings to improve the overall gaming experience on Android. The release of Nougat delivered high-performance realtime 3D graphics with the Vulkan API and the launch of Pixel phones provided the first Daydream-ready devices tailored for immersive mobile VR. Elsewhere, the expansion of Firebase provided the tools and infrastructure to support developers throughout the lifecycle of their game with features like real-time analytics, push notifications, storage, and ads. To streamline the integration, Firebase is now completely available for C++ and Unity developers. Today, during our annual Developer Day at the Game Developers Conference, we introduced new tools to improve the overall discovery on Google Play, especially supporting developers who build high quality and engaging games. Promoting high quality experiences based on engagement, not just installs: With the enormous variety of games available on Google Play, there are many instances when great games don't get the visibility and attention they deserve. Recently, we've begun tuning our algorithms to optimize for user engagement, not just downloads. This is one of our ways to reward quality, which for games means promoting titles with stickiness (strong engagement and retention metrics) as well as a more traditional measure like a high star rating. 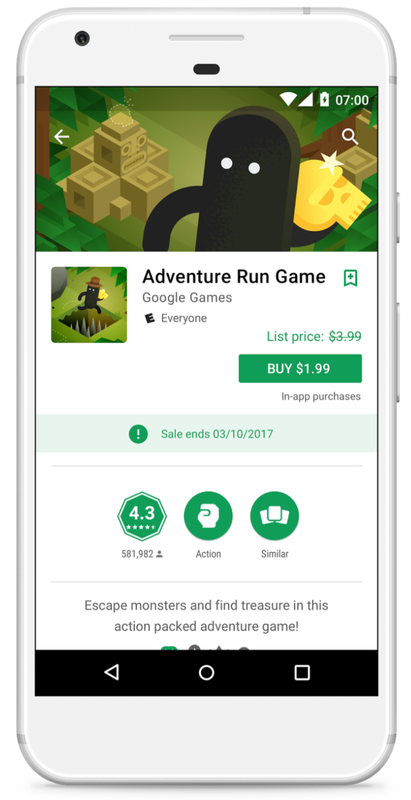 Offer sales and increase purchases of premium games with strikethrough pricing: Available in the Google Play Developer Console starting today, strikethrough pricing allows developers to run their own price promotions on paid apps and games leading to greater awareness and conversion. During our pilot phase, developers not only saw a 3x–20x lift in installs during their promotions, they also maintained a nice lift once the sales ended. More curation of high quality games through editorial pages: One more way we'll highlight quality games is through new editorial pages on the Play store launching later this month. These pages allow our editors to hand-select games exemplifying optimal gaming experiences on Android. They allow users to explore different game styles and genres with editorial reviews on themes such as epic RPGs and top racing games. At our Developer Day, we also gave attendees a sneak peek at some high-fidelity games coming to Google Play later this year. Including titles from major studios to indies, and even two new VR titles, there's something for every gamer! TRANSFORMERS: Forged to Fight by Kabam is a new high-definition, action-fighting mobile game set in an immersive world. The game will feature authentic Transformers "more than meets the eye" action, allowing players to engage with Optimus Prime, Megatron and many other popular Autobots and Decepticons in a stunning 3D environment. The game will be available worldwide on April 5, 2017. Battle Breakers is a new frenetic tactical role-playing game from Epic Games, powered by Unreal Engine 4. A vibrant fantasy sci-fi cartoon adventure, Battle Breakers lets you recruit and build a dream team from hundreds of unique heroes to battle monsters as you take back the Kingdom, one break at a time! Injustice 2 lets you guide your stable of Super Heroes and Villains to victory. Expanding on the hit game Injustice: Gods Among Us, Injustice 2 delivers brand new characters, tons of exciting new modes and the look and fighting style that NetherRealm Studios is known for. Injustice 2 will be available on Google Play for Android devices in May. Virtual Rabbids is the first VR Rabbids experience on mobile developed by Ubisoft Montpellier in collaboration with Bucharest. Available this spring on Daydream, players will find themselves in some of the most precarious situations as they race to save the planet. Beartopia is a cooperative multiplayer village game by Spry Fox. Make friends, work together and grow a thriving community. Later this afternoon, we'll host a series of lightning talks to share what it takes to launch successful VR and AR games, build with Firebase, implement machine learning in your game, and so much more. Visit our site for more info and the Google Developer Day schedule. For those who can't make it in person, watch the live stream! This is just the start of what we have planned for 2017. We hope you can make use of these tools to improve your games, engage your audience, and grow your business and revenue.